We rolled into Green River, Utah, dusty, tired and happy after 1,700 miles of dirt roads and trails. But we are getting ahead of ourselves. 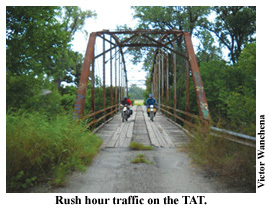 In the spring of 2009, five riders from Minnesota set out on the Trans-America Trail, better known as the TAT. The TAT is a network of public dirt roads and trails that runs 4,700 miles from eastern Tennessee to the Pacific Ocean in Oregon. The creation of Sam Correro, the TAT is his labor of love. He mapped the route and provides those maps, for a small fee, to adventure riders up for the challenge. Having normal lives, none of us could take a month away from home so we broke the TAT into three sections. In 2009, we rode from eastern Tennessee to Oklahoma (see MMM #113). This year, we picked up where we left off riding through Oklahoma, New Mexico, Colorado and Utah. Sam has the TAT laid out in daily sections routed motel-to-motel. We considered camping, but a shower and A/C is thoroughly enjoyed after a day of 100ºF in the dust. An average day was 200 miles, which seems light, but can be grueling on the unpaved roads and trails we traveled. Preparation for the trip was the usual endless debate over gear and logistics that ended with frantic packing. The six riders included Paul, Kevin, Marty and Victor (first leg alumni), along with TAT rookies Gus and Sev. What had seemed so far in the future was suddenly happening. We hit the road in a flurry of packing and greasy fast food. We arrived in Salina, OK late morning. There was some head scratching as we tried to strap a week’s worth of gear to our bikes. Sev, keen to try his hand at navigating using the maps and roll charts, took the lead as we plunged into the Oklahoma countryside. The route wound through small river valleys, irrigated cropland, then out into open range. That pattern would repeat itself many times through Oklahoma. We arrived in Bartlesville, our destination for the night, in the heat of the afternoon. Evening brought cooler temps and the inevitable list of post-first day adjustments. The morning broke with Sev discovering his bike now adorned with Buddhist prayer flags and an attempted conversion from a door-to-door evangelist. Rather than being jettisoned, the flags flew from his bike for the duration of our trip. We plowed into the Oklahoma heat early and it didn’t let up. Fifty miles into the day Victor’s DR-650 got the first flat tire of the trip. The change went smoothly with the group holding his jacket over him to create some shade and Victor’s spare fuel can from Roto-Pax doing double duty supporting the bike. Around noon, we happened upon some cows that had figured out how to defeat the cattle guard. We saddled up like six cowboys and, with a little help from the rancher, had our future dinner back grazing. Towards evening, we turned south for our night’s destination, Alva, OK. Ten miles out of town the road got sandy. It was a loose, dry powder that had us slogging through for several miles. Kevin had a spill and his ankle was tweaked from getting caught under his BMW F650 GS. We limped into Alva hot and tired. The next morning we got an early start to stay ahead of the heat. Kevin took a break from the trail today, heading to the next motel by road. We spent the morning chasing through the rolling hills of some open range. We also began to see oil wells. These were small, automated operations presenting curious silhouettes on the horizon. We stopped for lunch in Buffalo, OK. This small town in western Oklahoma has embraced the TAT so much that they put up official highway signs on the trail that welcome riders and give them directions into town. After a lazy lunch at the excellent, rider-friendly Shorty’s (it was two hours lounging. No one wanted to leave the splendor of their A/C), we got back on the trail. About 40 miles outside of Buffalo, we stopped for a quick break. We were standing quite literally in the middle of nowhere, when we spotted two bikes approaching. Up pulled a pair of riders on seriously-kitted Honda 650s from the U.K. Gabe and Nick were riding the TAT as well. Gabe (www.GABE-RTW.co.uk) was in the last couple weeks of a 16-month round-the-world trip. Nick had joined him for the U.S. and the TAT. We rode together for the day and invited them to stay with us that evening. We had a wonderful time hearing stories from our new friends. The next morning we got our usual late start. Gabe and Nick were out early, as they had planned a longer day than us. That was good because our morning was a comedy of errors. First, we were so slow departing that even the 80-something couple watching the show from their sedan grew weary and told us we should get going. Then, Victor led us out of town the wrong way, but a couple small corrections had us back on track, but then we got split by a train. Three of us made it through the crossing before the train came through. The train then stopped, blocking the crossing, while another train passed going the opposite direction. We took the opportunity to taunt each other during the delay. After regrouping, we hit some proper sandy two-track. The route, no more than two deep, sandy ruts, ran due west into the sagebrush. We all struggled and the sand claimed two bikes. No serious injuries, but Kevin was still nursing a sore ankle from earlier in the trip. We made it through the sand and back into irrigated agricultural land. This part of Oklahoma was so flat that one photo shows the curvature of the earth! After lunch, temps again soared to well over 100ºF. Sev pointed his DR-350 into the ditch, seeking cooling overspray. The oddest part about this area was the large irrigation pumps. Unmuffled V-8 motors were coupled to the well pumps. They roared along on the edge of fields and added an eerie hum to this otherwise silent country. New Mexico greeted us with a dramatic change in scenery. Gone were the agricultural fields and now mountains began to appear in the distance. The route ran through more open range, then dropped into a deep canyon. At the bottom, we wandered along red-hued walls past a couple of small ranches. On the opposite end of the canyon we got our first good climb. It was just a few hundred feet, but contained orange-sized rocks and tight switchbacks. Before we knew it, we were in Colorado. The route continued through a wide plain with mountain ranges growing taller on each side. Rain developed but we only rode through it for a few minutes. The weather cleared and temperatures mercifully dropped as we arrived in Trinidad, CO. The historic railroad town was charming and we were thrilled to be on the doorstep of the Rockies. Our start this morning was even lazier. We intentionally planned the next two days short to allow time for photos and side trips. Sev and Victor set about re-jetting Sev’s bike for altitude while Kevin, Gus and Paul, dubbed the “Nancy Drew Explorer’s Club”, went in search of the road up to the city sign overlooking the town. Bikes tuned and pictures taken, we headed out into Colorado’s front-range. The initial climb was gentle and easy. Wide, smooth gravel roads led us up into thick pine forests and alpine meadows. The weather was perfect and we reveled in it. Lunch was in a great honky-tonk breakfast joint in La Veta, CO. The road climbed higher during the afternoon and soon we were above 10,000 feet. Sev’s carb ministrations were spot-on. Our route headed north into the San Isabel National Forest. The roads continued to be nice gravel without the mud we feared from recent rains. About twenty miles out from our destination we decided to do an extra-curricular ride on some jeep trails. The trail was rocky, steep and too much fun. With our heads full of thin air, we rolled into the town of San Isabel, CO.
Today began with a stop at one of the stranger roadside attractions you’ll ever see. Called Bishop Castle, this edifice is a strange mixture of obsession and tax protest. Built by Jim Bishop, (he vehemently declares it was built by him alone) the castle is a massive stone structure perched on a saddle between two mountains. It’s perennially under construction, open to the public, funded by donations, and a must-see if you’re on Hwy 165 near Wetmore, CO. The TAT plunged deeper into the San Isabel National Forest and over the Wet Mountains. The afternoon found us in Westcliffe, CO, with the Sangre de Cristo Mountains lying in front of us. We skirted along their flanks heading north, eventually crossing them and turning south into Salida, CO. Just a couple miles outside of town Marty got our second flat of the trip on his BMW G650 X-Challenge. We heckled him as he successfully completed his first roadside tube swap. We started the day with breakfast at a super-cheap breakfast joint popular with KLR riders, there were three parked out front. The local forest rangers had advised us that the Hancock Pass (on the route for today) was closed due to washout on the road that hadn’t been repaired. We had a Plan B for the day, which included the equally-challenging Tin Cup Pass that would loop us back onto the official TAT route. The road out of Salida was smooth and fast. We ran past a few resorts and a lot of tourist traffic. At St. Elmo, we left the traffic behind as we began our ascent up the Tin Cup Pass. The trail was rocky and steep in spots, but we all made it. We were feeling heroic in the thin air, until grandma and her granddaughter came riding by on a 4-wheeler. Our egos in check, we headed for the summit. The road near the top was actually backed up with ATVs waiting for a shiny Hummer to make the top. Being impatient, we snuck by on the outside of a very steep cliff. The ride down the Tin Cup was just as tough as the ride up. Sev and Kevin had traded bikes at the summit. With the base of the pass in sight, Sev bounced through some loose rocks and went down. He rolled very gracefully off the bike, but came up clutching his left hand. We removed his glove and found a Z-shaped pinky finger. Crap. A quick check of the map showed the nearest hospital 50 miles away in Gunnison, CO. We splinted the finger and headed for the ER. Sev got checked in at the ER and Victor remained with him while the rest of the group headed for that evening’s destination, Lake City, CO. If you are going to dump your bike, Sev recommends tossing your friend’s machine. The good news came after a couple hours of waiting around the ER. Sev’s finger wasn’t broken, just dislocated. The nurse reset the joint with no fuss and we were on our way. Sev and Victor were out of time for the remaining section of the route that day and headed straight for Lake City. Hwy 149 that leads to Lake City was a wonderful rising and falling road that was as scenic as the section they missed. The morning greeted us with cool mountain air. For the first time this trip we were digging out our jacket liners. At breakfast we ran into a couple riding two-up on a KTM 990 Adventure. Matt and Kelly were celebrating their anniversary with a month-long trip. They were riding the same section of the TAT and we invited them to join us. We headed out to the highest pass so far, the Cinnamon Pass. The route was through a deep, alpine valley with the road clinging to the edge of the steep valley walls as we climbed higher and higher. In our TAT tradition, any thoughts of our “gritty adventurer” status were erased watching Matt. 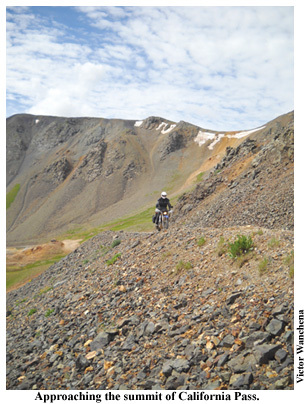 He expertly guided his 540-pound KTM up steep, rocky inclines and technical trails with ease. Kelly hung on from the pillion snapping photos on the go. We limited our whining about our “heavy” bikes from thereon after. This section of the TAT includes some incredibly scenic passes. There was the Cinnamon Pass, the California Pass, the Hurricane Pass, and Corkscrew Gulch to name a few. That afternoon, Matt and Kelly headed off to tackle the infamous Black Bear Pass, while we headed south on Hwy 550, better known as the Million Dollar Highway. The rain finally caught us in the afternoon and we got drenched. We had been on the road all day without seeing any fuel stations and all needed to top off our tanks from our spare fuel bottles. The rain continued like a typical mountain downpour as we searched in vain for a dry spot. Victor spotted a slightly drier spot under a tree and decided that was better than nothing. As we refueled, the rain changed to hail. Crap. Then, to add insult to injury, two miles down the road we were out of the rain and back in the sunshine. We continued our descent on what’s known as the Western Slope with the mountains finally giving way to high desert crossed by the occasional green valley. We crossed into Utah and found our night’s lodging in Monticello, UT. Morning broke with gray skies and rain. Thunderstorms had been through overnight and continued into the morning. We breakfasted under the awning of a gas station and reviewed the plans. We were heading north today, through Moab and into Green River, our final stop for this leg of the TAT. A few miles outside of town we hit a long stretch of mud and Victor had a graceful dismount. It was almost like he was frosting a cake in gooey, red clay that stuck to everything. The roads dried out as we headed north toward the Manti-La Sal National Forest. We climbed back up over 10,000 feet and found fresh snow along the road. On the northwest side of the range we began our descent and were treated to a panoramic view of Moab and the Canyonland National Park. The route into Moab was a stunning route through red canyons and slick rock outcroppings. We took a break for lunch in Moab and ran into our old pals, Matt and Kelly. They wanted to show us a fun side trip out to Canyonlands. We headed across the slick rock, passing natural rock bridges. The roads in the slick rock are fascinating. The road surface is largely bare rock, giving unbelievable traction, but can be hard to follow without the normal indications of a graded road. We began our descent the Long’s Canyon outside the park, at a spot called Pucker Pass. The trail was in tough shape from recent rains. We rounded the first turn and found a SUV blocking the way. He was completely stuck, high-centered on a big ledge. There was no way around as the trail was only a few feet wide with near vertical walls. While the SUV waited for rescue, we turned around, said our goodbyes to Matt and Kelly, and headed for Green River. The TAT headed out into the largely uninhabited desert. The roads were fairly good, with only a few sections of sand and silt. We rolled into Green River dusty, tired, and happy after 1,700 miles of dirt roads and trails across the stunning beauty of the western US. This was easily the best dual-sport ride any of us had experienced. The plan is to rejoin the TAT in Green River next year. The challenges will be new as we head out into open desert and go further west. Our goal is the end of the trail, the Pacific Ocean. For more information on the TAT, or to plan your own trip, visit www.transamtrail.com.